Students will create a digital scrapbook that showcases the viewpoint of the main character of a novel. When we read novels, authors provide details about the main character through descriptive sentences, events that directly involve the character, and what other characters think and say about the main character. To show what you know about the main character in a novel you are reading, create a digital scrapbook for this person! Scrapbooking is becoming a popular pastime. Asking students to demonstrate knowledge in this format provides them with an opportunity to express individuality and creativity in an authentic, popular format. Inviting local community members who scrapbook or a local scrapbook company representative to speak to the class regarding their creative techniques may help further inspire students. Share examples of traditional and online scrapbooks with students. (You can find online examples in the resources section). As a class, discuss differences they see between a traditional scrapbook and a digital scrapbook. 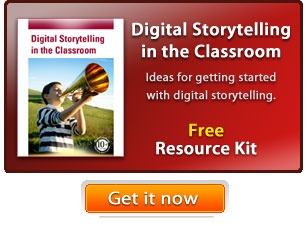 Ask students to consider the composition of images, and use of text, narration, and sound effects. Discuss how the use of multimedia elements can change the impact of a scrapbook. Have students choose a novel they have recently read and focus their attention on the main character of the story. Have them reread the story and take notes in the form of a double entry journal that describes the main character and events that take place during the story, focusing on events that the main character is directly involved in and what other characters in the novel say about them. You can also have students complete a character attribute map or graphic organizer to help them get a deeper understanding of the main character. Ask students to share their preliminary ideas for the scrapbook. This is a great time to check for understanding. The more students understand the actions, behavior, and events the main character is involved in, the easier it will be for them to create a scrapbook from the main character's point of view. Share your expectations for what their scrapbook will include. For example, you might spell out what you would like to see on each page. The cover should include the character's name, the title of the book, the author's name, and your name. A summary from the main character's perspective. Images that reflect events important to the main character. Include a caption for each that explains why it was included. One letter from the main character to a secondary character about a problem in the story. A second letter for the secondary character's likely response. At least three objects that reflect events in the story or important aspects of the main character. Include an explanation for each. An entry from the main character's diary that shows growth over time. Have students complete a storyboard to help them map out the design and content of their scrapbook. When you have approved their storyboard, students should begin gathering resources from the Internet, or the library and Pics4Learning. Then have them use the tools in Wixie or Share to add media elements to each page of the scrapbook and create navigation between the pages. Have students present their finished scrapbooks to their classmates, working with a partner to explore and evaluate the media included. You might also consider sharing the scrapbooks with the school librarian or media specialist or invite them in to help evaluate the final products. They may also be interested in posting student work to a station in your school's media center or library as a way to get other students interested in reading the book. If you require the journal entry, letters, and diary entry to be written before the structure of the project is designed, you can assess the writing even before the scrapbook is complete. The double– entry journal and character attribute map will give insight into the direction students are heading with their project. Assessing these items prior to any other written work can help ensure the successful completion of the project. The final scrapbook will help you assess their understanding of being able to analyze and depict the main character through multimedia elements. 6. Interpret words and phrases as they are used in a text, including determining technical, connotative, and figurative meanings, and analyze how specific word choices shape meaning or tone.